Models larger that 250 feet begin to be problematic in the game, faces flip, flicker and or dissapear altogether. There are a few things you can try that have worked for me in the past. 1) Try raising the model in binedit in ten foot increments then try it in the game. This has worked for me several times with arena's, but not 100% of the time. 2) Flip the faces that are dissapearing in binedit so the same textures appear on both sides of the faces. This works when the faces are flipping in the game. 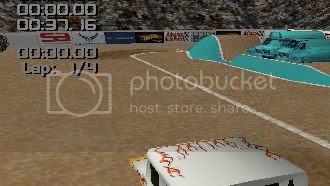 3) Remove the problem faces from the arena altogether and save as a separate model then insert with traxx as a second model. Note the second model may do the same thing, if it does then cut it in half creating a third section. Another note, doing this may affect the origional arena causing problems in other areas so be sure and save all model variations with each step so you can always revert back... just in case. I've been lucky with each of those techniques in the past, it all just depends on the particular geometry of the problem model. I've often wondered if a reordering of faces option in binedit would be a quick fix but never got around to getting it implemented. yeah, this models about 750 feet long so i guess it falls under that category, lol. i flipped all the faces on the disappearing walls and that worked. thanks for the help!